See everything! Be active! Ride everywhere! We specialize in organizing private tours from 1 to 150 people in different languages, to different places and different levels of cycling. Itinerary is based on Guided tour option and can be changed or customized on request. Start time, meeting point, duration & program for private tours are flexible and can be customized according to your request. 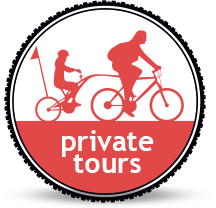 Private tours are available on classic and electric bikes, tandems, Team bike (bike for 7 people). Tour can start from our Meeting point at Dlouha 24 in the center of Prague or from any other place according to you request. Please contact us for more information at info(at)prahabike.cz.